According to the International Data Corporation (IDC ) Worldwide Quarterly Cloud IT Infrastructure Tracker , vendor revenue from sales of infrastructure products (server, storage, and Ethernet switch) for cloud IT, including public and private cloud, grew by 23.0% year over year to $7.6 billion in the third quarter of 2015 (3Q15). The overall share of cloud IT infrastructure sales climbed to 33.8% in 3Q15, up from 28.7% a year ago. Revenue from infrastructure sales to private cloud grew by 18.8% to $2.9 billion, and to public cloud by 25.9% to $4.6 billion. In comparison, revenue in the traditional (non-cloud) IT infrastructure segment decreased by -3.2% year over year in the third quarter, with declines in all three technology segments (server, storage and Ethernet switch). All three technology markets showed strong year-over-year growth in both private and public cloud segments, with server experiencing the highest growth in private cloud at 24.3% and Ethernet switch with the highest growth in public cloud at 37.8%. Public cloud spending on storage grew 26.7% year on year. "IDC continues to see healthy double-digit growth in cloud IT deployments in the market with an increasing preference for public cloud infrastructure," said Kuba Stolarski , Research Director for Computing Hardware and Platforms at IDC. "Customers are modernizing their infrastructures, having a progressively larger number of viable options for cloud deployments either on or off premises. These customers depend on a mix of as-a-service offerings and traditional infrastructure to help meet the IT transformation requirements of their organizations. As public cloud offerings continue to evolve and improve in reliability and security, customers are becoming more comfortable with the flexibility that they get by deploying certain workloads in these elastic environments." At the regional level, vendor revenues from cloud IT infrastructure sales grew fastest in Japan at 47.1% year over year, followed by Asia/Pacific (excluding Japan) at 35.3%, Western Europe at 22.1%, Canada at 22.0%, and the United States at 20.1%. Central and Eastern Europe declined at -10.2% year over year as the region continues to go through political and economic turmoil, which impacts overall IT spending. 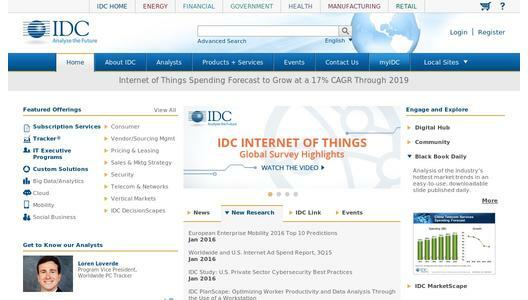 For more information about IDC's Worldwide Quarterly Cloud IT Infrastructure Tracker, please contact Lidice Fernandez at 305-351-3057 or lfernandez@idc.com .